If you are planning a wedding in Hamilton, and in need of a limousine, there are many different options to consider. Such things include the size of limousine that you need, the style, and of course, your budget requirements. If you have allocated a certain amount, and have a large wedding party with important family that needs to be taken from ceremony to reception, then it is best you reserve a larger limousine such as a party bus limo or limousine bus. With Platinum Party Bus Limos, you can choose these types of limos and get the opportunity to select from a fleet of a variety of different styles and sizes. From party bus limos that seat 18 – 26 passengers, and larger more luxurious limousines that seat 30 – 50 passengers, you will be able to find the right party bus limo for your Hamilton wedding. While Platinum Party Bus Limos specializes in offering professional party bus limos for weddings, we also provide you with party bus limos for proms, night out limousines, corporate limousines and more. We have booking agents that are standing by to provide you with assistance by answering any questions that you may have. 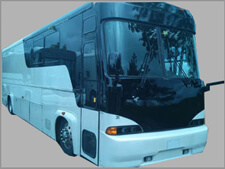 We can assist with your party bus limo today, so contact us for your party bus limo in Hamilton.